How many children do you have? Between my husband and me, we have 6 kids. Three are his and three, mine. His are all biological: Michael, Melissa and Colleen; I have one biological son, Rory Taylor, one adopted daughter, Maggie and a step-son, Nick, that I consider my son. How many grandchildren? What are their ages? We have 5 grandchildren, 4 girls and a boy. Sacnite’, nine; Micah, six; Aurora, two ½; Clara, two; and Violet, one. What do your grandchildren call you? Granny Angel, Granny, or Angel. How often do you get to see your grandchildren? Our 2 ½ year old granddaughter, Aurora lives in the same city—in fact just a few blocks away. We see her every week or two. Sacnite’ and Violet live in Fayetteville Arkansas and Micah and Clara live in Fairfax Virginia. I go over to Arkansas every few months to visit and they were here for the Christmas holidays. They may be moving here sometime next year. I see the two in Fairfax about once a year. Beyond the initial elation, what most concerned you upon hearing you'd soon be a grandma? The news for each felt a bit different. With our mixed family and the distances, I was initially concerned about whether I’d get to see Micah as much as I’d like. He has three other grandmas! I guess that’s been my concern about all of them—just getting to see them as much as I’d like. Sacnite’ is my son’s step-daughter. 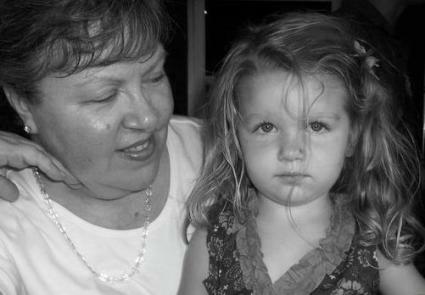 I knew about her since she was two and knew she’d be my granddaughter when she was about 5. She lived in Mexico with her mother at the time and I didn’t get to meet her until she and her mom got their visas and moved to the US when she was 7. Her sister, Violet, now age one, is my only biological granddaughter. I was able to go to her home birth—that was amazing. I had had Rory Taylor at home also. Sacnite’ and I talk via the Facebook video and that has been fun. I used to fly to Virginia at least once a year to see Micah and Clara, but with the poor economy, I just haven’t had the money. 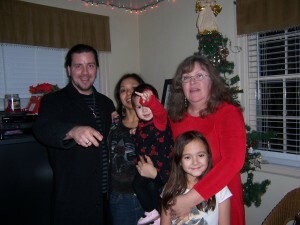 They came to visit us for 5 days after Christmas last year (2010) and I haven’t been able to see them since. I do regularly talk with their parents and see photos, but it’s not the same as being with them. Micah knows me, but I doubt Clara remembers much about me. What is the best thing about being a grandma? Being able to play with them and not worry about “teaching” or behavior that much. What is the most challenging part of being a grandma? Dealing with their parents! I don’t mean that in a bad way—it’s just that they all have their own parenting methods, and I have to remember about what that is for each family! I am very careful not to give unasked for advice or suggestions and am lucky that all the mothers like me and aren’t overprotective. Sacnite’ and I played board games and I had so much fun with her. She loves to pretend “cheat” and laughs when I catch her. What is your favorite thing to do with grandchildren who visit your house? Really depends on their age. I like to play games with the older two and just watch the younger ones play dress up or read books to them. What is your favorite thing to do when visiting grandchildren at their house? Reading, taking a walk, playing with their toys with them. Occasionally watching a movie. How do you maintain the bond between yourself and your grandchildren between visits? I send interactive e-cards to Micah sometimes. I also write letters. When Micah was into fire trucks, he wanted me to send him photos of different kinds of trucks by e-mail. He doesn’t like to talk on the phone and they don’t have video capability at present. As I said earlier, I talk with Sacnite’ on Facebook Video and sometimes to her mom and the baby on Skype. What do you most want to pass along to your grandchildren? That life can be fun, there are interesting things everywhere, that reading is important. What is one word you hope your grandkids think of when they think of you? Smiling. What is one thing you wish you had learned earlier as a grandparent? Knowing what my limits are. There are reasons most people have their children in their 20’s and 30’s! I can do 4-6 hours pretty easily, but if the child needs to stay overnight, it’s very tiring for me if they stay too long the next day unless I’ve prepared for it. What one bit of advice would you give a new grandma? When agreeing to keep your grandchild, get specific information about parents’ wishes and the time they plan to pick up the child. Keep toys and books at your home—of course you can lend them, but have enough for spontaneous visits. Do you have a website or blog? What is it about? I have a blog that I work on intermittently. I tend to go in spurts and starts. Before I was working full time, I had designed my own website and loved taking care of it. My current blog is mostly about art that I make, but I’ve lately started just writing thoughts as well. The URL is: http://angeltnart.blogspot.com/.